Jana Barker and Judi Ray have been friends for more than 30 years now. Their kids grew up together and Jana and Judi have always loved traveling and visiting tearooms together. So it’s no surprise that the two of them have researched and crafted their own unique tearoom and brought it to life in Mansfield. The Kupa Tea Tea Room & Shoppe just opened this past February and word is spreading. “Having our own tearoom has been on our bucket list for years,” says Jana. She and Judi began researching their project in earnest a few years ago. Since then they have traveled extensively in search of tearooms, visiting with owners and operators and searching for ideas for their own shop. “One of our goals was for our tearoom to be a step above other tearooms,” says Judi. 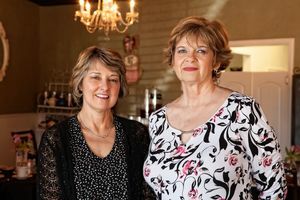 Neither Jana nor Judi had prior restaurant or food industry experience – Jana worked in the non-profit field and Judi has retail experience – but they share a passion for creating a vintage and elegant style tearoom. “There’s nothing like this in Mansfield and we think we fill a niche,” says Judi. The partners first looked for an open location in historic downtown Mansfield but nothing was available. Then they discovered space in a former consignment store just off N. Walnut Creek Dr. That was about a year ago. They leased the space and set about remodeling and reimagining. Drawing on all their research, the partners have created their own unique tearoom. They have furnished it with furniture and china they acquired at estate sales. Each table and chair set is unique as is the china that adorns each table. Darkly stained hardwood floors and beadboard on the walls give the place a charming country feel. Chandeliers dangle from the ceiling and a couple of old wardrobes show off vintage teapots and china. Stepping inside is like stepping into a small tearoom somewhere in the English countryside. It’s quaint and there’s only room for about 40 people but the atmosphere has a real authentic feel to it. Jana starts each day with a trip to the grocery store where she picks up all the fresh foods for the day. “We have no freezer here so you know everything is fresh,” she says. She meets chef Mike Calbo at the shop where he begins the day’s food preparation – each day features a unique soup and salad choice. Meanwhile Jana cleans and preps the dining area. She has one waitress, and when needed, Jana’s daughter comes in to help out. Judi is still working fulltime in North Dallas and is usually only at the shop on Saturdays or for special functions. “We are open Wednesday through Sunday during the lunch hour but we also host special events here like bridal showers and weddings receptions,” says Judi. The partners say they have been booked up for events nearly every weekend so far. Back in the kitchen, Mike Calbo draws on his experience in country club kitchens and high-end restaurants to prepare a menu that is classic tearoom fare but also offers a touch of café-bistro style. The menu is actually quite robust when compared to a traditional tearoom menu. Jana and Judi have worked hard to create an atmosphere that’s conducive to coming in for tea and staying a couple of hours to chat with friends. “It’s a quiet place where girlfriends can come and enjoy a little something to eat with tea in an elegant atmosphere,” says Jana. “We tried to create a place where we would want to go and be treated the way we would want to be treated,” adds Judi. When it was time to sample the menu we obviously had to start with tea. There are 13 different kinds of tea available – served iced in the summer and hot in the winter. Our meal began with the Provence Rooibos, a floral and fruity blend of lavender blossoms, elderberries, rosehip pieces, bilberries and rose flowers. It was clean and refreshing but not overpowering. It was a great example of a quintessential tearoom tea. A trip to Kupa Tea will always get you fresh, moist signature muffins before your meal. We started with a hot bowl of Roasted Red Pepper Tomato Soup served with Tuscan bread. This zesty starter was just right. Next came the Garden Pear Salad with Honey-Spiced Walnuts. It was a scrumptious take on the mixed greens classic served with sliced pears, dried cranberries, blue cheese crumbles with walnuts and pear vinaigrette. We also had a bit of the Gourmet Chicken Salad, fresh roasted chicken, slivered almonds, mixed with cut grapes and apples. You can’t go wrong with either of these salads. The quiche de jour on our visit was bacon, tomato and onion, with American and Monterey Jack cheese. Quiche would, of course, be a tearoom staple and this one would rank high. To finish things off in a sweet way we couldn’t resist the Caramel Bread Pudding, which both Jana and Judi say is a customer favorite here. It was fresh, hot and decadently sweet and served with a yummy Cinnamon Crème Anglaise. information 817-453-8955 or visit them on Facebook. Jana Barker and Judi Ray have been close friends for more than three decades now. They get along well and complement each other perfectly. Now they’ve taken their friendship to a new level by becoming business partners. Earlier this year they opened Kupa Tea Tea Room & Shoppe in Mansfield. It’s their take on the classic tearoom with a few personal tweaks the ladies came up with. We had a chance to visit with them one day this past spring. They were cordial and eager to chat up their new endeavor. Here’s more of what we found out about them. Q: What makes your food/menu unique? Jana: Every menu item is fresh made in-house from scratch. Q: Any new menu items on the way? Jana: We are adding appetizer selections along with fresh shrimp dishes and some delicious berry desserts. Q: What is the most popular or most requested dish you make? Q: How do you want customers to remember their experience? Jana: Good atmosphere, good food and good service. Q: What is your favorite type of food to eat? Jana: Just about anything Mike (the chef) comes up with. He is so creative with his recipes. Q: If you go out to eat, where do you go? Jana: Tex-Mex, we don't have it on our menu (yet). Jana: Going to estate sales, traveling and spending time with grandkids. Q: Do you have a favorite quote or advice you've received or given? A: Judi: Give your whole heart into what you love and never, never, never give up on your dreams! Q: What's the last book you read? A: Judi: The Restaurant Manager's Certification Course! Q: If you had to choose another profession what would it be?